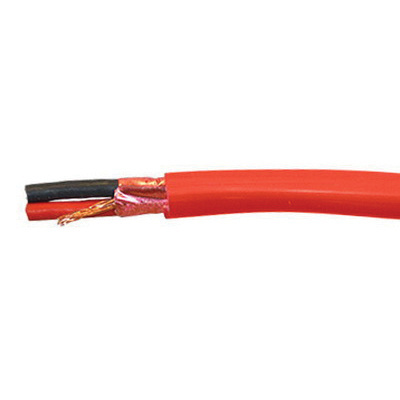 Omni Cable VITALink® 14/2 Riser-rated fire resistive cable has red low smoke zero halogen polyolefin jacket to withstand harsh environmental conditions. The low-smoke zero halogen thermoset Fire-Roc™ layer insulation resists electrical leakage and offers protection against environmental threats. It has 100% aluminum polyester shielding that reduces EMI/RFI interference/crosstalk. It has voltage rating of 300-Volts. This copper cable withstands temperature rating of 105 deg C. It is suitable for manufacturing, commercial and industrial locations, colleges, high-rise buildings, hotels, airports and stadiums, health care facilities, tunnels and subways. Cable is UL listed and meets NEC standards.